This week's Clinging to God & Guns episode we're playing a new round of Gun Ban Theology, better known as “Stump the Pastor.” Lloyd reads three brief excerpts from gun-ban Christians who refer to Scripture to back up their arguments and Pastor Bennett gives us his reactions off the cuff. Shop at Shop at GunMagWarehouse. This week Lloyd reads excerpts from gun ban Christians who argue alternately that we are sheep among wolves and therefore should not carry guns to defend against the wolves who want to kills us, there are no good guys or bad guys because we are all sinners (and therefore we need gun control) and, finally, that we were created by God to fight evil in the world and that God will not return until we come together to ban guns. majesty to be our defense against all our enemies; through Jesus Christ, Your Son, our Lord, who lives and reigns with You and the Holy Spirit, one God, now and forever. Amen. 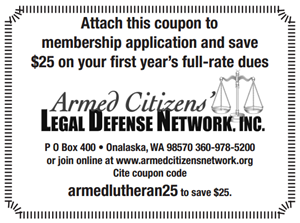 Thank you to our Reformation Gun Club members! Be the first to comment on "ALR Episode 163 – Stump the Pastor"